Mukesh Ambani led Reliance Industries Limited (RIL) has acquired controlling stake of 78% in Network 18 Media & Investments Ltd (NW18) for Rs 4000 crore; along with its subsidiary TV18 Broadcast Ltd. This has been hailed as the biggest coup in Indian media, ever. In order to accomplish this transaction, Reliance has used their existing subsidiary: Independent Media Trust (IMT), into which they have pooled in Rs 4000 crore after their Board’s approval. RIL is the sole beneficiary of IMT. Interestingly, Raghav Bahl, founder of Network18 has sold his stake and will remove himself from the media giant that he created. It is said that after July, he will no longer be associated with Network18 operations. Additionally, Rajdeep Sardesai, who was the most popular editor and journalist of CNN-IBN has also resigned from Network18. Staff members and associates of Network18 are in a confused state as of now, as they really don’t know what plans Reliance has with regards to this media house. 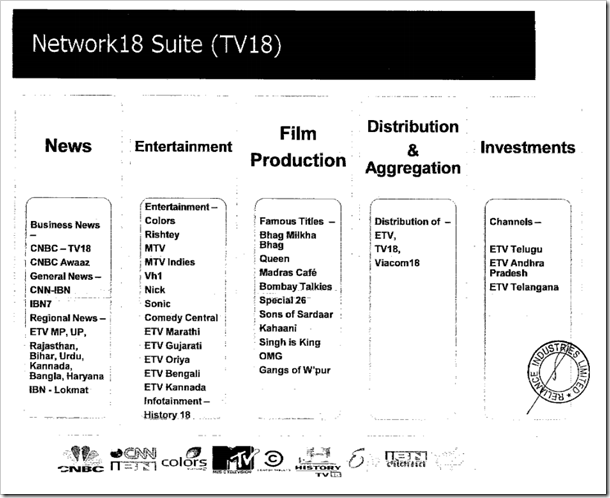 Which Media Is Owned By Network 18? Network 18 was founded by Raghav Bahl in 1993, and is considered as a giant in the Indian mass media industry. In the year 2012, they had revenues of Rs 2100 crore, and have around 5000 employees. Why Has Reliance Bought NW18? It seems that the content requirement for the to-be-launched 4G network across the country may have prompted Reliance to take over a media house which is active in TV, Internet, Mobile and Print. This gives us a hint that the hunger for content by 4G enabled smartphones and tablets will be certainly huge. And Network18’s dynamic media creation and internet and TV properties will help fuel this content hunger. Network18’s stocks have jumped 7% to close at Rs 45/share, meanwhile TV18’s share closed at 3% higher at Rs 35. At the time of writing this post, it has advanced another 5% to Rs. 47.65. Notably, the volume of shares traded for these companies was also higher compared to the average day. Against 2.4 lakh average stock trades for NW18 in any given day, yesterday 13.3 lakh stocks exchanged hands, whereas 93 lakh shares of TV18 were traded. RIL’s shares closed at 1% higher price at BSE. This deal was announced after the market closed. This is certainly a new dawn of Indian Media as a giant corporate has acquired a giant media house. Will it enable better content creation or it will signal the death of independent, free media? Do share your views by commenting right here! 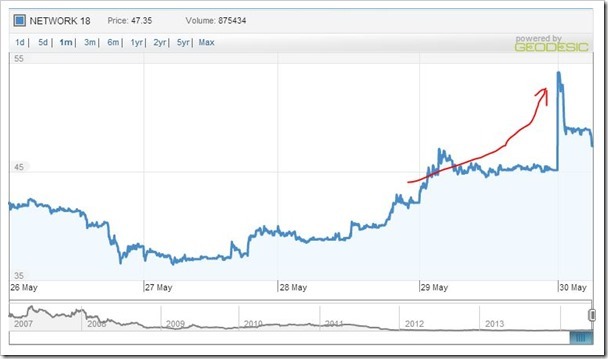 One thing is sure though, Reliance is betting really big on 4G in India, and it is great news for consumers!